Roughly, the history of the operation of the primary energy market is as follows: from 1993 to 2001, the spot electricity market required that the generation units (plants) committed, in a decentralized manner, their generation capacity and a single price offer (bid) of energy hour by hour for each of the next 24 hours. 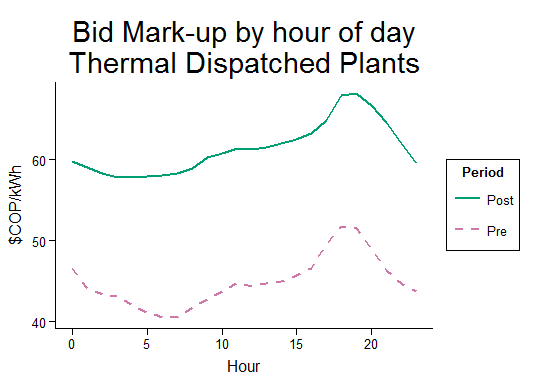 Using these bids, the system operator determined the lowest cost generation dispatch to satisfy the demand and the equilibrium price as the offered price by the marginal plant. This equilibrium price was used to compensate all the plants dispatched. After 2001, the Energy and Gas Regulation Commission (CREG, by its Spanish acronym) determined that, for each of the 24 hours, the plants could report a different generation capacity but with the same offer price. This design, however, did not take into account the costs of starting and stopping the thermal power plants. We know by the literature, and intuitively, that these non-convexities in the auction scenario hour by hour with a single offer price can lead to productive inefficiencies. On the one hand, thermal generators face the risk of incurring losses if the equilibrium price is not high enough to offset their start-up costs. On the other hand, turning off thermal running power plants and starting others with a lower marginal cost could result in inefficient production by ignoring start-up costs. Considering these inefficiencies, CREG implemented in 2009 a redesign of the spot market and the centralized dispatch of energy. Generators are now obliged to separate their offers into variable and quasi-fixed costs. In this way, they present bids per hour for the next 24 hours that consist of three parts (complex bids): i) the variable cost bid (the same for the next 24 hours), ii) start and stop costs level (the same for a period of three months), and iii) the maximum available capacity (a different value for each hour). With this information, the system operator determines the lowest cost generation level to satisfy the demand and the equilibrium price as the price offered by the marginal plant. Meanwhile, dispatched plants that cannot cover their fixed costs at the market price are compensated with an additional income to that corresponding to energy sales. The literature indicates that this mechanism solves problems of inefficiency, but generates incentive problems. In particular, the auction mechanism used to request the information from the generators in order to determine equilibrium prices and dispatch can create an incentive for the generators to exaggerate their costs. Although this incentive is also present in a context of decentralized commitment, the possibility of strategic behavior increases in the presence of complex bids. However, there are no theoretical studies with conclusive results on which design is better, so the problem becomes empirical. Along with international consultants, Professors Shmuel Oren of UC Berkeley and Luciano de Castro of U. Iowa, Quantil developed a model of the entire Colombian electricity dispatch that emulates the model of dispatch of XM. We used this model to assess the economic efficiency of the system. Under different specifications of the model, the results show that, given certain levels of power generation, the total costs of electricity production in Colombia have decreased since 2009. This suggests that the changes in regulation contributed to greater productive efficiency in the market. Specifically, the gains in productive efficiency ranged between 5% and 11% of the efficient generation cost per year. However, in Figure 1 we show that the simulated prices, which reflect what would have happened if the resolution were not implemented, would have been lower than those observed. Figure 1 also shows evidence that prices in the spot market have increased in real terms. 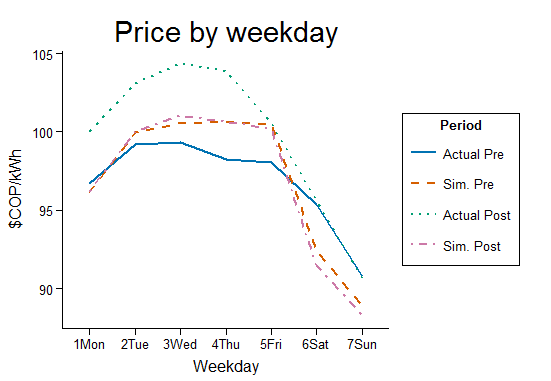 Figure 1: The vertical axis shows the average price for each day of the week in constant prices for December 2012. The dotted green line shows the average since Resolution 51 came into effect. The dotted magenta line shows the simulated average in the counter-factual scenario in the absence of the Resolution. The blue solid line shows the average observed prior to the entry into force of the Resolution. Figure 2 shows that margins (offers from plants minus costs) have increased since 2009, suggesting an increase in the exercise of market power by generators. This observation is consistent with findings for the United Kingdom and Ireland, countries that have implemented, in some phases, a centralized commitment mechanism similar to that of Colombia. Figure 2: The dotted magenta line shows the average margin (offer minus cost in constant value of December 2012) per hour before Resolution 51. The green line shows the same, but after Resolution 51. 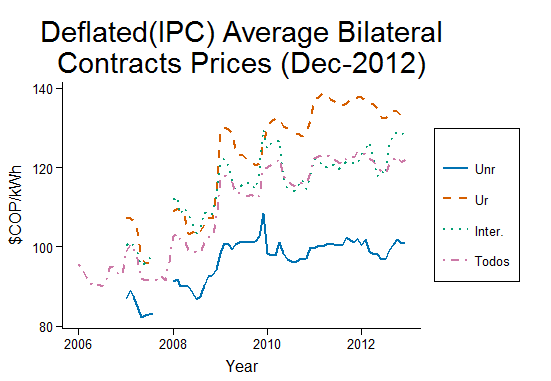 Finally, Figure 3 shows that the average price of bilateral contracts has increased since Resolution 51 came into effect. It is important to note that all these calculations control for the characteristics of demand and supply that were changing over time. Figure 3: Average prices of bilateral contracts unregulated users (Unr), regulated users (Ur), intermediate users (Inter. ), and all users (Todos). This suggests that most efficiency gains have been appropriated by energy producers rather than consumers. Therefore, although productive efficiency has increased, the additional strategic flexibility of generators may have reduced the welfare of final consumers.